It seems the Chinese are just like everyone else. They have artists out on the edge of society, they have run-down factory buildings, and just like in the West, when you mix the two you get a hip urban district and art incubator. You also get the certainty that the arty part of town will become gentrified by an influx of galleries, bistros and the idle rich. Project 798, directed by Lucius C. Kuert, takes us to the Left Bank/Greenwich Village/SoHo of Beijing where we find that we’re a day late and a dollar short. Most of the Chinese artists interviewed agree that commercialization has ruined their cozy enclave (though there are a few that don’t complain and I have to wonder about them). Curiously, the ones who are complaining don’t seem too nostalgic for the bad old days. I guess if you’ve spent your life dodging state censors, having to go find some new studio space isn’t so bad. Project 798derives its name from an empty factory building whose construction was guided in the 1950s by East German advisors. As a consequence, Building 798 has a Bauhaus look that is definitely not Chinese. This works well with the Chinese art now being made there because it could just as well have been made in Berlin, or Los Angles, or Tokyo. Some of the Chinese artists interviewed acknowledge that their art is international and not Chinese. One artist even wonders if there is any modern Chinese art as such. A problem with an art survey like this documentary is that some artists who are included probably shouldn’t be, and some who should be included don’t make the cut. Obviously, this is the nature of the art game and as we know art/life isn’t fair. What I found interesting was that the work of the artists who were selected could have come from almost anywhere. It’s only when the artist is interviewed that you get the Chinese part of the story. I suspect that the stuff that will be remembered as Chinese Art has yet to be made and that Building 798 is just the starting point. I was also surprised to see that Yue Minjun’s smiling face doesn’t appear in Project 798. Having made Time Magazine, his work may be the best known Chinese art in the West and by that measure he is also already passé. In fact one of the 798 artists makes a cutting reference to “smiling art”. It is so 2005. In bringing together this Chinese Band of Brothers, Project 798is also like most other Western art samplers in that the boys dominate. 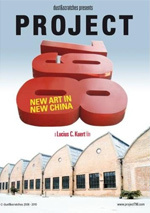 Of the 14 artists featured in Project 798, only two are women, Yu Hong and Liu Fei. Sadly, both of 798’s ladies are something of an embarrassment. It feels like Kuert was pressured to include at least a couple of women in the mix, and these were the two he could scrape up. Both of them could fit comfortably in any Midwestern state fair art show. Of the two, Yu Hong was the more interesting having been a state-trained painter who’s now trying to sort out what she should do next. There’s nothing like a solid background in your craft before you launch into the theoretical stuff. Liu Fei on the other hand has a good idea (ironic fossils) but unless she comes up with another one, she is going to become a one-trick pony. But the boys are not that far ahead. Feng Zhengjie, the painter with two colors on his pallet (red and green), is also from the Run It Into The Ground School of painting. There is also He Yunchang, the token Chinese Performance Artist. It is encouraging to see that Chinese conceptual art is as sad and unrewarding as it is in the West. Imagine how red our faces would be if the Chinese had somehow got conceptual art right. The main point is that this is simply art from China and I wonder if these people were all from Kansas City, would we have ever heard of them. I found the interview of Huang Rui to be the best of the litter. He claims to have found Building 798 while looking for a cheap place to work. He jokes that he could only get a five-year lease and that he won’t care what the place looks like in another five years. He says 798 is already too commercial and that it’s time to move on to the next low-rent neighborhood. I decided to take him at his word and imagine him somewhere in a forgotten corner of Beijing, free of development and the taint of commercialization (if in fact such a place exists), with another cadre of intrepid Chinese artists living the bohemian dream. Project 798 is shot on digital video and the image seems a bit off color... or maybe I never recovered from Feng Zhengjie’s eye-sizzling painting. This is not the last word in Chinese art but may be the only one available right now. It’s definitely worth a look and it left me wanting to see more.